Suk Bahadur Lama of Rayale village of Kavre isn’t too worried about food, like many in this district east of Kathmandu, he is more concerned about finding shelter from the rain at night. A heap of bricks and timber is all that remains of his house and cowshed. 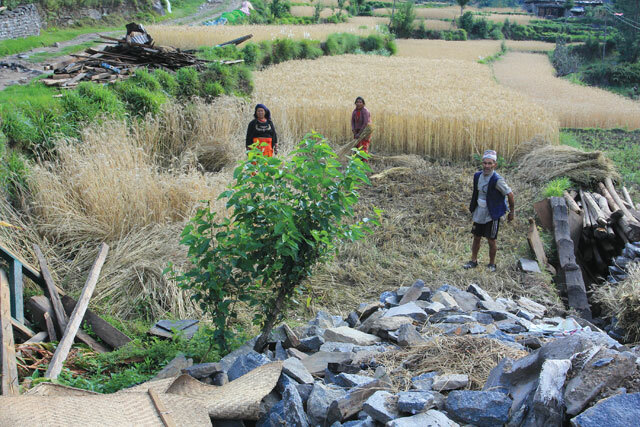 In a familiar sight across the 15 districts ravaged by the earthquakes of 25 April and 12 May, Lama and his family are busy weeding their corn fields, harvesting potatoes and watering the cabbage and cucumber patch right next to their ruined home and tarp shelters. The rice seedlings are waiting for the rain for transplantation. Thousands of farmers have lost relatives, all their livestock, seeds, and food stores. Less fortunate families need emergency food aid, shelter, as well as rice seeds for the planting season which is only three weeks away. With families and homes gone, many are too disturbed to turn their minds to farming. Because these districts also have a high outmigration rate, there are fewer helping hands in the farms and for reconstructing homes. The loss of livestock means there aren’t enough animals to till the fields, milk production has plummeted in districts like Kavre where the dairy industry was the mainstay of the economy. With the livestock gone, there isn’t enough manure for the fields. Even if agriculture is revived, experts say, there will be a decline in productivity. Subsistence farmers who depend on rain-fed agriculture are going to be hit hardest, especially if the rains this year are late, as predicted. Despite the calamity and devastation, farmers are hardwired to farm because they instinctively know growing food is survival. In Dolakha Bazar, which suffered massive destruction in the 12 May aftershock, Pramila Shrestha rummages inside the ruins of her home to try to retrieve the family’s seed store (see box). She runs out as another aftershock hits. Some of the plastic containers are crushed, but she is happy to recover the rice seeds. Dhading, Kavre and Sindhupalchok are important sources of vegetables for Kathmandu. Although demand in the capital has gone down because 1.2 million people left after the earthquake, farmers are readying to sell vegetables again to earn money. Flights from the Gulf and Malaysia are full of Nepali migrant workers coming back, many of whom have taken unpaid leave and bought their own plane tickets home to help rebuild and help plant paddy. Since the 15 most affected districts are not food surplus areas except for dairy and vegetables, the impact on Nepal’s total agriculture production is not going to be very big. The districts around Kathmandu account for 10 per cent of Nepal’s total rice production and 19 per cent of the corn. The Ministry of Agriculture estimates that the damage to agriculture from the earthquakes is Rs 15 billion. Still, it is a race against time to get food and seeds to farmers before monsoon begins in mid-June. Some families need simple things like metal containers to store their potato and corn harvests, or agricultural tools. The historical town of Dolakha Bazar was devastated in the earthquake. Pramila Shrestha, 17, lived in a house here which was destroyed, and has been living in a tent with 25 members of seven families. The upper floor collapsed, but since the roof and walls are intact no one has helped the Shresthas. The kitchen fell on the storeroom below, and all the family’s belongings, food and seeds for the planting season are buried underneath. “I couldn’t even buy a sanitary pad because we had no money,” said Pramila (pic, above) who was preparing to take her Grade 11 exam before the earthquake, and now has constant headaches and is running a fever.